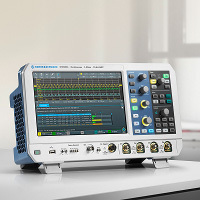 Here's how it works: you trade in your existing qualifying oscilloscope (see below) against the purchase of a new R&S®RTM3000 or R&S®RTA4000 series oscilloscope with at least 350 MHz bandwidth and you get 30% off the price of both the scope itself and the bandwidth upgrades applied (but not other hardware and/or software options). The promotion runs until June 30th 2019 and cannot be combined with any other promotions. Contact Us or Call 01480 412451 to find out more.